How to Erase iPhone Data before You Sell It? Before reselling your old iPhone on eBay, donate it to charity, sending it to Apple or just give it to your friend, you may get used to perform a "Restore" operation on the iPhone to wipe your data. However, restoring can not really erase data from the device. Just like "Delete" option, formatted data are still here in the iPhone, the iPhone system mark them invisible and inaccessible. These formatted or deleted files can be easily retrieve back by using special data recovery software. We just shudder to think that our personal data like mail, contacts, text messages, account info and password revealed and known by other people. In order to protect our private data, it is urgent to find a way to erase the data on iPhone permanently without the ability of recoverable. 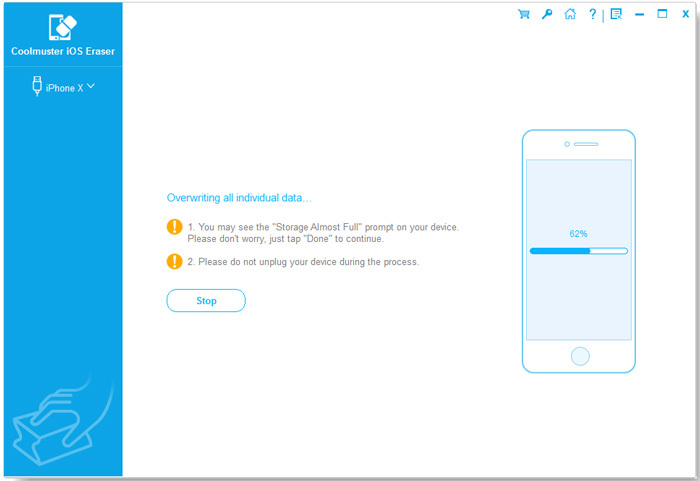 Here in this article, we will show you how to deleted iPhone data permanently with third-party software that professionally designed to erase iPhone data for selling. Since deleting and restoring to factory default settings can not really delete the data on iPhone, what I want to recommend here is using the Coolmuster iOS Eraser, which provides you with the proper way to permanently delete all data, such as contacts, text messages, call logs, emails, account info, passwords, videos, photos, documents, etc., from all iPhone models. 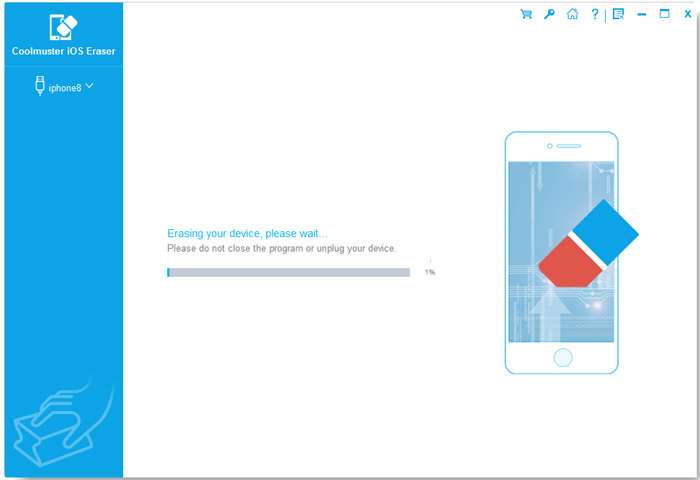 After erasing data with this tool, you can not get them back with any recovery tool. Besides, it is compatible with all iPhone models, including iPhone Xs Max/Xs/XR/X/8 Plus/8/7 Plus/7/6s Plus/6s/6 Plus/6/5S/SE. The Windows and Mac version are both available, so you should get the right version downloaded on your computer. How to Delete Movies from iPad? How to Delete Music off iPhone? Practice always can say everything! Let's see how this software works together. We wrote the tutorial as below, telling you how to wipe all data from iPhone by using Coolmuster iOS Eraser. Here, we will set Windows version as an example. If you are a Mac owner, you can get the Mac version and refer to guide as well. Tips: Please do back up data on your iPhone before getting further, because the program will erase all data and settings from your iPhone without restoration. And ensure the latest iTunes has installed on your computer to ensure successfully connection. First of all, download and install the data erasing program for iPhone on your computer. Launch it and you will see its clear and user-friendly interface showing like below. Connect your old iPhone that you want to give away to your computer using the Apple provided USB cord and once the connection is successful, your iPhone will be detected by the program automatically. Just click "Erase" button to move on. The program offers three different levels of data erasing for your choice. 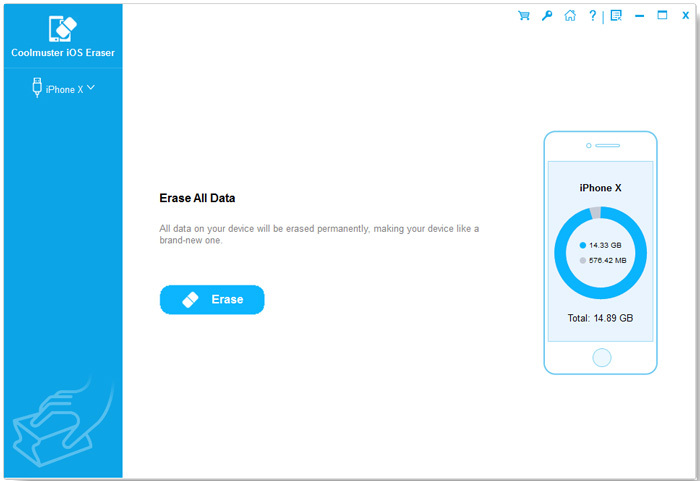 The first level will erase your iPhone data quickly to save your time. The second level will leave no traceability of data erasure and use random data to overwrite all existing and deleted data on your iPhone. 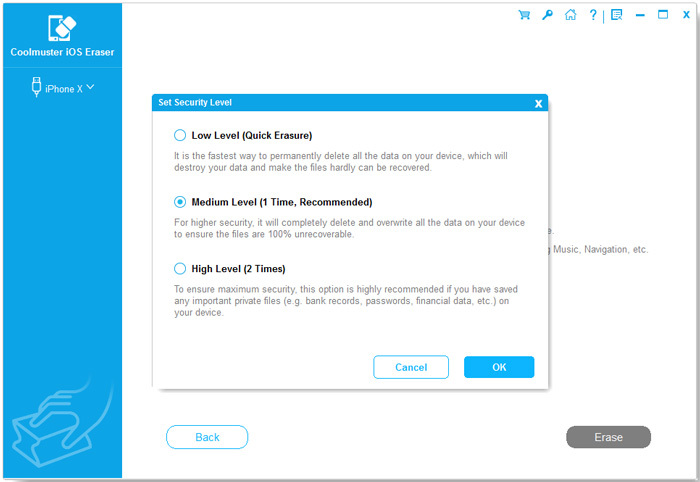 The third level is the most secure but time-consuming option which will write over the data 3 times. You can directly use the default second level. If you choose Middle or High level of erasing, the program will continue to overwrite your iPhone data to ensure higher security for your personal data. Please keep your iPhone connected to the computer until the erasing process finishes. When it is done, you will get a totally "clean slate" iPhone with no data on it at all. No any data recovery tool can recover them from your iPhone. Therefore, you should make a proper backup of your important data on iPhone before you perform the permanent deletion. Here is an article about how to backup iPhone data. Hope it helps!